Successfully Added Animated Zoetrope Wall Clock - 12 Inch Face, Running Man Animation, Modern Design, Quartz Movement, Ultra Quiet to your Shopping Cart. This unique Zoetrope wall clock is the perfect asset to any modern-style living room, office, or teenage bedroom. Thanks to its animated design, this 12-Inch wall clock displays a moving picture of a walking man. Not only does this give a cool effect, it also motivates people to get moving and leave their home on time for an upcoming appointment. It features a large display which gives it a modern look that suits any style of interior. Powered by one single D-Battery (not included), this wall clock brings along 6 months of continuous usage time. Once out of juice, the battery can be easily replaced in the blink of an eye. Thanks to its quiet quartz movement, your Zoetrope wall clock produces a minimum amount of sound. This means that there won’t be any distracting ticking noises – making it suitable for office spaces and bedrooms as well. Its quartz movement system furthermore provides you with highly accurate time readings. With this large clock on your wall, you can be guaranteed that you’ll never be late for a meeting again. The clock itself has been crafted out of durable and high-quality ABS material which gives it a high-end look. 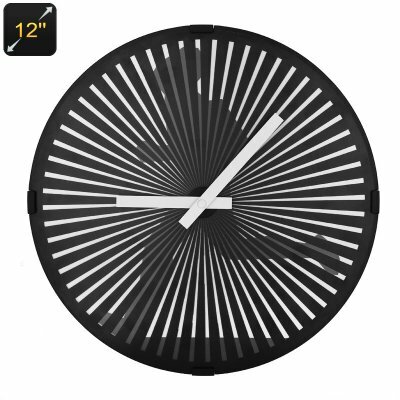 If you are looking for a cool wall clock that brings some joy and movement into your life, this gadget is perfect for you. This wall clock comes with a 12 months warranty, brought to you by the leader in electronic devices as well as wholesale electronic gadgets..